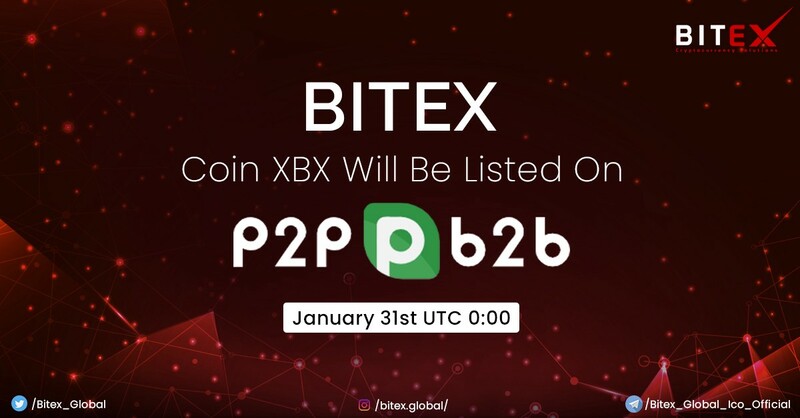 Bitex Global XBX Coin was listed on P2PB2B on January 31st. Many Exchanges listing means many markets for XBX and introducing XBX to the world at the same time. The first step of globalization is to have the XBX coin available worldwide. The next step of Bitex is our product launch and we are happy to announce that in less than 30 days we will be able to announce when we will allow users to deposit and start trading. This is a great step towards locally embedding a global platform. Our related applications are already in production and we are very pleased to announce that the XBX future is bright as we keep building. We survived the bear market now it is truly time for us to shine. Thank you for your continuous support.